Get the latest gear at the Record Rack estore! Global Experience. Proprietary aquaculture technology. That's what you get with Sportsman's Choice®. Our aquaculture lab, with state-of-the-art equipment and a world-renowned Ph.D. team, creates fish formulas that maximize performance. For bigger trophy fish in your waters, feed Sportsman’s Choice® and catch some serious results. The right feeds for even bigger game. Sportsman’s Choice® has a full line of products to help you attract and grow a bigger class of bucks. All Sportsman’s Choice® products are engineered with the right nutrition to fit your specific need. Whether you’re a wildlife watcher looking to see more deer on your land, or an avid sportsman looking to bring in a trophy, we've got the right feed to meet your goals. Few shortcuts end up proving any worth. This is perhaps no more true than when considering food plots. There's more to the process of establishing a deer mineral site than simply dropping a salt block at the edge of a woodlot. Without a healthy crop of fawns year in and year out, you’re taking steps backwards in the arena of deer management. 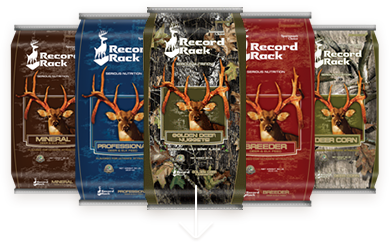 Hear directly from the breeders who feed Record Rack Deer Feeds to their herds. See their results and success stories for yourself!